My first encounter with a terrarium was back in science class when the exercise was designed to be informative rather than decorative. Housed in a pop-bottle, the science projects hardly looked elegant, but I saw their potential, and the intrigue is with me today. 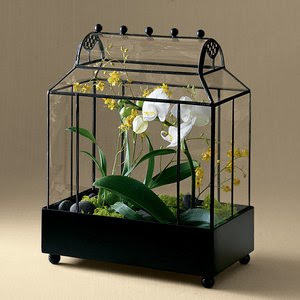 An easy way to green your living space and suitable for even the most novice gardener, terrariums have limitless appeal. 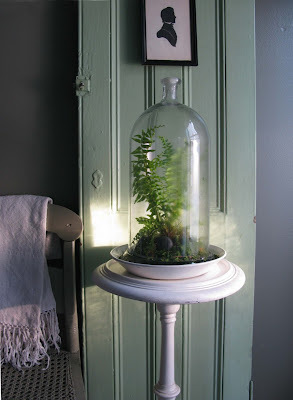 Weather housed in a Wardian Case, cloche jar or even an aquarium these little microclimates add macro design punch while being green to boot. 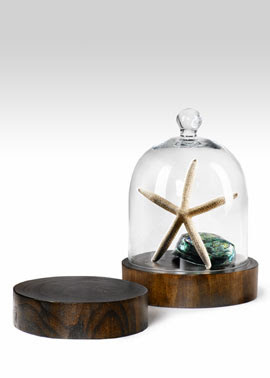 Cloche Jars are one of my favorite types and they can be recycled for other uses-- a display for treasures, a beautiful cake cover or use the bottom for entertaining. Even more eco friendly is if you can find one of these at an antique market, a la Eddie Ross (pictured in his home below). 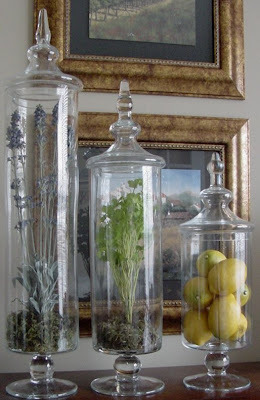 Apothecary jars can also be used to make a terrarium, check out English Creek Gardens for some great holiday gift ideas... For easy an easy tutorial on how you make your own-- check out the info here and here.